WELLESLEY, Mass. 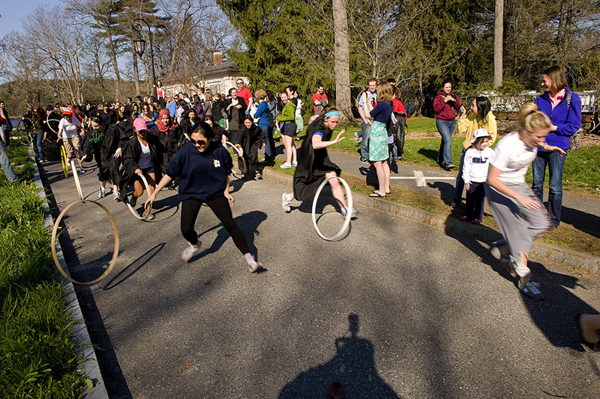 -- Susan Wang of McLean, Va., and Seoul, South Korea, is the winner of this morning's 114th annual hoop rolling competition at Wellesley College. 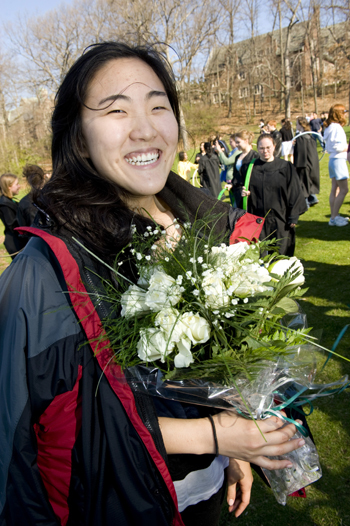 Wang, who will graduate June 5, was met at the finish line by President H. Kim Bottomly and Dean John O'Keefe, where she was presented with a bouquet of white roses filled with spring greenery, in honor of the 2009 class color, green. "It felt amazing," Wang said of winning the race. "I didn't even realize that I won until my friends, Kendall and Julia told me. I fell over right before the finish line and wasn't sure what was going on." Her friends Kendall LaSane and Julia Thomas met her at the finish line to spur her on. "They were cheering me on," Wang said. "So I had to get up and roll my hoop!" In keeping with tradition, she was promptly carried by her classmates to the edge of Lake Waban and tossed into the chilly water. "Rose-Ellen El Khoury and Kyla Raetz threw me into the lake," Wang reported. "Needless to say, it was freezing cold. I only got dropped in to my knees, but everyone wanted me to go in further, so I went all the way in." Wang said it reminded her of orientation to Wellesley, four years ago, when all of the new students in her residence hall celebrated by jumping in the lake. Traditionally, the winner of the contest, which first began in 1895, was said to be the first in her class to marry. These days, victory is seen as a sign that the winner will be the first to achieve success, however she defines it. Wang, the daughter of Jin Wang and Hye-Seon Lee Wang of Seoul, South Korea, is an economics and French major. She is president of Beebe Hall. "I love the Beebe community and many of my activities center around my role as house president," she said. "This year, I've been a member of Student Unity, House Presidents' Council, Liaison to WEED [the environmental group], and sit on the Sustainability Committee--going green like the Green Class!" Wang has also recently been elected to Phi Beta Kappa and Omicron Delta Epsilon, the international honor society in economics. She won the Distinguished Mentor Leadership Award last year and received First-Year Academic Distinction. 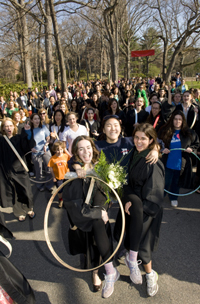 Hundreds of Wellesley College seniors, many dressed in academic gowns, made this morning's 1/8 mile dash, rolling old-fashioned wooden hoops in a race to the finish line. Wellesley College has been a leader in liberal arts and the education of women for more than 130 years. The College's 500-acre campus near Boston is home to 2,300 undergraduate students from 50 states and more than 65 countries.